Malana a remote village near the Malana nala which is part of the Parvati valley is untouched by the people of the outside world till recent past. 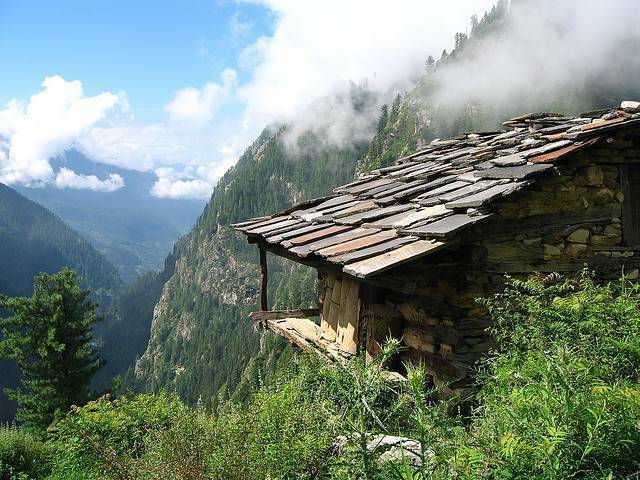 Surrounded by the Deo Tibba and Chandrakhani peaks Malana offers a serene and silent surrounding to all city dwellers. Malana is famous world over for the locally grown cannabis, or "charas" commonly known as Malana Cream. Malana has now become popular place among foreign back-packers in Himachal Pradesh. Malana trek is a popular trek in Kasol region. Recently night stay by outsider in this village has been disallowed, camping outside of village area is possible however. Magic Valley is another popular nearby tourist hot spot and not closed for outsiders. Weather in Malana is always nice except peak Winter and Monsoon months. Buses for Malana are not frequent so check on reaching Kasol. Most travellers coming to Malana also trek to Kheerganga, a very popular trekking destination. Many treks go via Malana such as Chanderkhani Pass trek, Waichin valley, Malana Tosh trek and Malana to Rasol trek.